When 14-year-old Emmitt Till was shot in the head and then thrown in the Tallahatchie River in 1955, his mother joined a list of women who lost their sons to American racial violence. That history is on display outside the art collective venue Ideal Glass in the East Village, where artist Sophia Dawson’s mural, Every Mother’s Son, inspired by a documentary of the same name by Tami Gold, is on display until November 30. The mural is made up of portraits, from Mamie Till to Lesley McSpadden (Michael Brown’s mother), of mothers who continue to seek justice for their sons long after they've been criminalized and forgotten by mainstream society. The memorial was commemorated by an open mic event at Ideal Glass on Friday, November 7, which was attended by the mothers of Anthony Baez and Anthony Rosario, whose sons were killed by police in the mid-1990s, under the tenure of then-and-now Police Commissioner Bill Bratton. New York City visual artist Sophia Dawson decided to pay her respects to black and Latino mothers who lost their sons to police and extra-judicial violence. 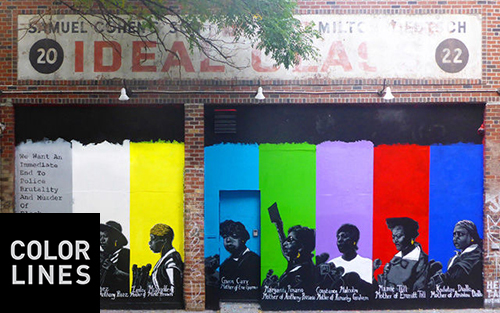 In a new mural called “Every Mother’s Son” on the Lower East Side, Dawson honors Kadiatou Diallou, Mamie Till, Constance Malcolm, Margarita Rosario, Gwen Carr, Lesley McSpadden and Iris Baez.